Get ready to Rosé All Day! Sugarfina will have you saying yes way to rosé with this 3pc Rosé All Day Bento Box. You can stop and smell the rosé with these amazing rosé-infused candies beautifully presented in a unique artisanal, high quality gift box. Sugarfina, founded by a couple who love candy and each other, was named one of the world's 50 most innovative companies in 2018 by Fast Company. Candies includes are But First, Rosé Roses, Rosé All Day rosé-infused gummy bears, and Sparkling Rosé Bears dusted in tart sugar crystals. Get ready to Rosé All Day! Sugarfina will have you saying yes way to rosé with this 3pc Rosé All Day Bento Box. 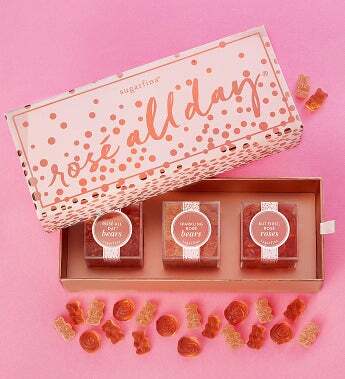 You can stop and smell the rosé with these amazing rosé-infused candies beautifully presented in a unique artisanal, high quality gift box.